P.S. The Eucharist we celebrate really is the real presence of Jesus Christ. It is so substantially not accidentally. 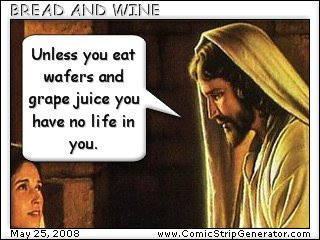 So it might seem that we are only consuming bread and wine that is not the case. It is the case that in reality we consume Christ as He who underlies (or stands under or the real essence if you prefer) the accidents of the bread and wine. PPS. Language can be tricky. I'm so sending this image to my prot family and my cousin who chased me around her church with a tray of oyster crackers saying "body o' Christ". I e-mailed it to my friends and family, too.